This past January, veteran Nascar writer Jeff Gluck found himself in an unfamiliar situation. 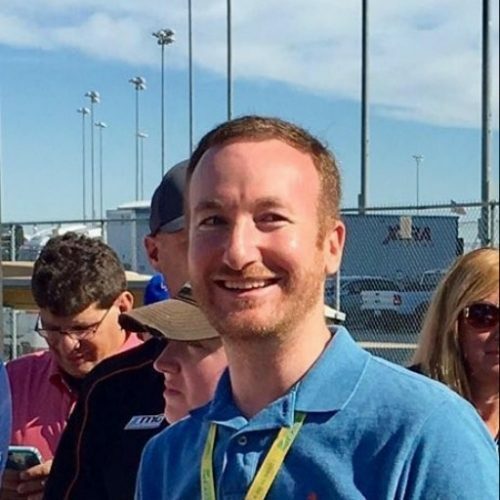 He had spent the previous 11 years as a dominant beat writer for the sport, and in his last four, which were spent with USA Today, he had acquired a loyal following, solidifying himself as a leading Nascar voice. But when Gluck’s wife was asked to relocate to pursue a new career, the 36-year-old writer’s future suddenly seemed uncertain. Could he follow her and keep his job? His editors at USA Today, it turned out, wanted him to stay in Charlotte. So instead, Gluck decided to leave the publication and try his luck writing for his own website. 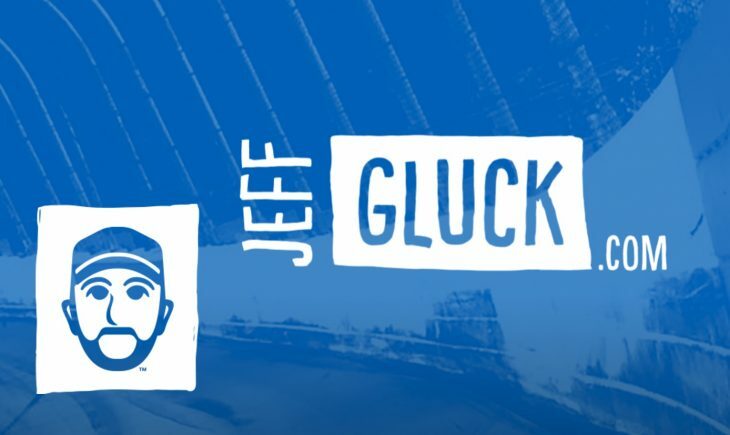 Gluck soon launched jeffgluck.com and The Untitled Jeff Gluck Podcast, deciding to fund the two through the crowdfunding website Patreon. His initial expectation for crowdfunding was that he would pull in enough revenue to cover travel expenses to attend as many races as possible. But after some initial research, Gluck lowered those expectations and questioned his future in journalism. Today, just four months since he launched, Gluck’s Patreon page has 859 patrons and his revenue was $6,749 last month. If that holds, he will pull in $80,988 this year. Though Gluck’s earnings from Patreon are not all salary – he uses it to fund travel expenses and Patreon takes a 10 percent cut – his success highlights an innovative approach to funding journalism. But not every journalist who has tried crowdfunding has had the same success. And even for those journalists who have seen donations pour in, the longevity of that success isn’t guaranteed. Still, despite the uncertainty about its longterm sustainability, the journalism world has seen a steady increase in the number of crowdfunding ventures launched per year. According to a 2016 Pew Research Center study, the number of funded journalism projects on Kickstarter rose from just 17 between April and December 2009 to 173 between January and September 2015. The total amount of funds raised for crowdfunded journalism projects on Kickstarter was a whopping $1.7 million between January and September 2015. 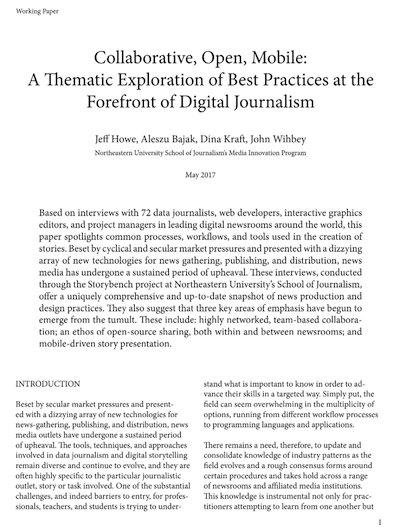 At first glance, the difference between self-funding journalism through a paywall or subscription-based website and crowdfunding through websites like Patreon or Kickstarter may seem minimal. But Gluck saw a drastic contrast between the two while researching some other journalists’ work. Gluck also credits his decision to crowdfund from a podcast he had listened to every day for two years. In order to run a successful crowdfunded platform such as Gluck’s, there are a lot of chips that have to fall into place. Gluck specifically credits some of his success to the community of Nascar fans and their special connection to the sport. But while Gluck’s foray into crowdfunding and more than $6,000 a month look great on the surface, he admits that self-publishing content comes with more than a few challenges. The first obstacle: travel. Gluck uses a good portion of the money he earns on Patreon for travel expenses. In order to produce the best content possible, he travels to as many races as he can. In fact, he estimates he will spend $35,000 a year traveling to races. Gluck plans to attend at least 30 of the 38 total races this season. A screenshot from one of Gluck’s fan profiles. Social Spotlight: A weekly feature of a member within the Nascar industry, where Gluck sheds light on the subject’s social media usage. 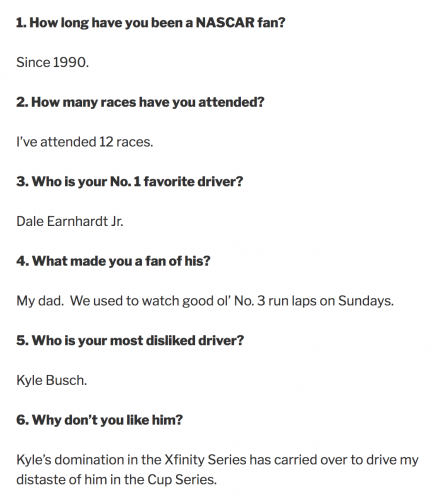 Fan Profile: A 12-question survey, in which Gluck profiles a Nascar fan. Fantasy Playoff Game: A free fantasy Nascar game, created by Gluck, with standings updated weekly. 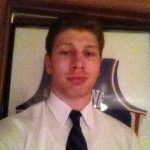 DraftKings Fantasy Nascar Picks: A piece where Gluck posts his weekly Nascar picks on DraftKings, a fantasy sports site. Good race poll: A poll after every race in which readers can vote yes or no on whether or not they enjoyed the race. On March 12, Gluck saw a boost in popularity online after finding himself in the perfect position to capture the brief fistfight between drivers Kyle Busch and Joey Logano in Las Vegas. His video, which he posted to his website, went viral. 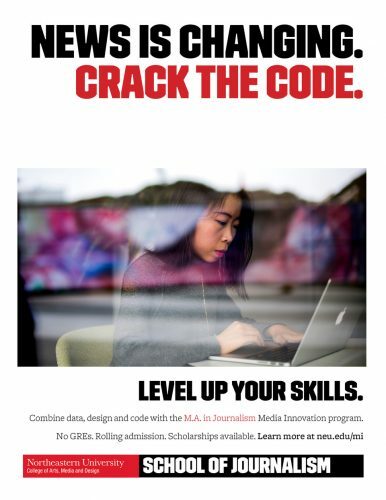 Brooks Sutherland is a student in the Media Innovation graduate program at Northeastern University’s School of Journalism.